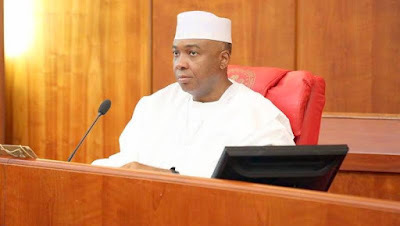 Senate President, Bukola Saraki, on Tuesday stated that the 8th Senate will work to streamline Nigeria’s multiple taxation system to improve the ease of doing business in the country. Speaking at a dialogue at the 22nd Edition of the Nigerian Economic Summit in Abuja, the Senate President, while answering questions from the audience, stated that Nigeria’s corporate taxation system needed to be reformed and revamped to get the country out of the economic recession. Speaking on the ‘Made in Nigeria’ theme of the summit, the Senate President lauded the organisers for keying into the Senate’s plan to empower home-grown businesses and ensure that Nigerian brands are strong enough to be patronized by our people and exported abroad. “It is our hope that Nigerian businesses can begin to benefit from the over N2 trillion in government expenditure in the 2016 budget,” he continued, “So that we can reduce the demand on foreign exchange while simultaneously creating employment, moving towards self sufficiency, increasing our GDP and boosting our Internally Generated Revenue (IGR). Saraki also stated that the anti-recession Bills that the Senate has scheduled for passage by December ending include: the Petroleum Industry Bill; the National Development Bank of Nigeria (Establishment) Bill; the Nigerian Ports and Habours Authority Act (Amendment) Bill; the National Road Fund (Establishment) Bill; the National Transport Commission Act of 2001; the Warehouse Receipts Act (Amendment) Bill; the Companies and Allied Matters Act (CAMA); the Investment and Securities Act (ISA); the Customs and Excise Management Act; the Federal Competition Bill; and the National Road Authority Bill. Saraki also mentioned that since the beginning of the year, the Senate has worked to fast-track the over 40 priority bills recommended by the National Assembly Business Environment Roundtable (NASSBER), an initiative in which the Nigerian Economic Summit Group (NESG) is a major partner. The Senate President also said that one of the plans that the Senate has to ensure the passage of the Petroleum Industry Bill (PIB) in this administration, is to break the Bill into different sections for easier passage. The Senate President emphasised that with the passage of the PIB, Nigeria would generate more revenue from oil — putting it on track to come out of the economic recession.